Advent Calendar: Yay or Nay? Tomorrow is December 1 - the traditional start of the advent calendar countdown. Let's just say I'm not ready. Lucky for me, my children won't notice if I start a few days late. 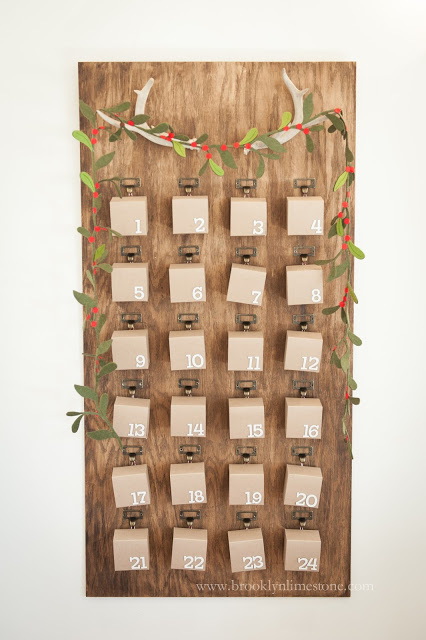 Even though its a bit of hassle, I sort of loved my DIY rustic antler advent calendar I did last year. Of course there are so many great ideas elsewhere too. Really simple versions like this advent calendar in a jar from White Gunpowder, a super simple ornament version by Casa Haus, or a sleek modern approach from Journey into Creativity. But my most favorite one - both for ease and function is from Live Laugh Rowe. She took a linen over the door shoe organizer and made a fabulous one. Not only is it easy but the pockets are nice and large so you can put all kinds of things in there which is great for multiple children or when you don't want to have to worry too much about size. Love that! What about you? Do you do advent calendars at your house? And if you do, who has it all ready to go and who is scrambling at the last minute like me? I think I had a revelation this morning - we haven't had luck getting my toddler to eat his daily vitamins that his ped. prescribed - I think I'm going to buy some gummie vitamins and make that his daily treat! #amomcanwishright? 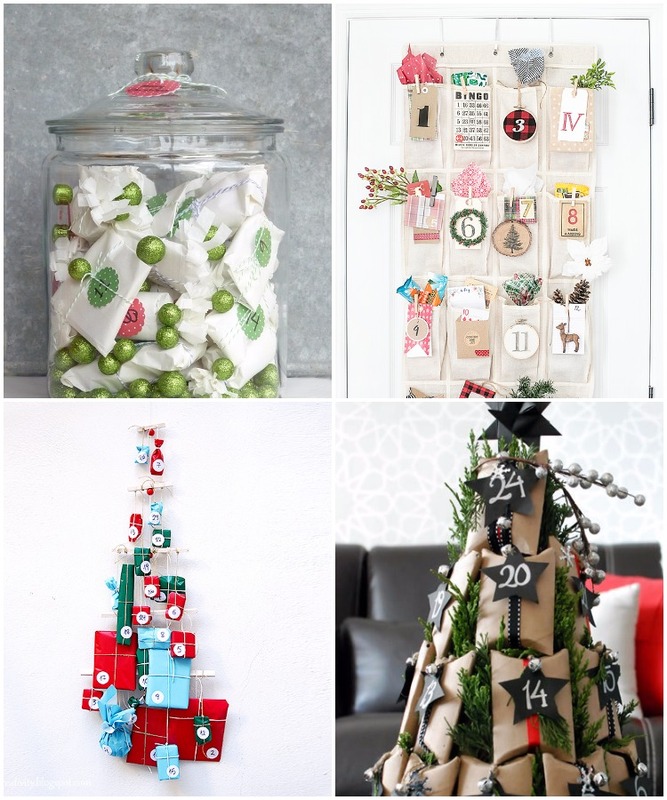 Love all these examples of advent calendars! Gummy vitamins are the way to go. My daughter loves them!! Maybe I should put some broccoli in there?? i seriously wasn't going to this year.... i just had a lot to do. but then we've done it every year and it felt like breaking a tradition. and i love having these special traditions with my kids.... they are 9&11 and still believe in the magic so i want it to just keep on being magical. so i came up with a super last minute idea and my advent calendar diy will be posted like halfway through the season, but maybe next year someone can use my idea. ;) ha! I honestly don't even want to think about the day my kids no longer believe! I will squeeze every last ounce of Christmas magic until that day comes. Even though she really loved it last year, I could have totally skipped it this year if I wanted to because she wouldn't notice with all the other exciting things going on but I want to do whatever I can reasonably do. I get a bigger kick out of her reaction than she does getting the little trinkets! That linen organizer is genius! We do an advent calendar and the kiddos love it. I try to mix it up with activities and outings instead of candy treats. I just finished it up this week and posted about it! It's very hard to actually put one together every year. We're past the Advent calendar age. Some years I made one, some years I bought cheap calendars with little windows that open but most years we did a weekly Advent instead of a daily one. It was so much more easy to manage. The weekly fits in with our faith so well. The one we loved the most though was a book. You read a few pages every day then lit candles & had a longer Advent celebration once a week. EVERYONE loved the books we read. We all wanted to read more than the allotted pages for each day. We started this around age 10, after the daily gift ideas had been outgrown & become too expensive to keep up. We have a couple advents - one that was my parents' when we were growing up - just simple felt ornaments. And then a friend bought Henry a chocolate advent - just a $2 version from World Market. It's the first thing he asks for every morning, so I'd say it was a success. Nothing major and no planning or stress on my part - but it's a fun tradition.